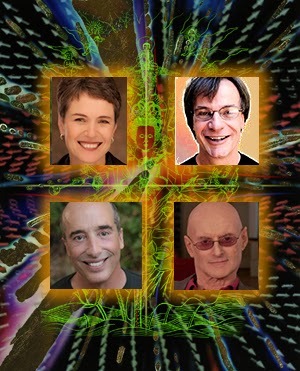 The four Integral teachers on the Subtle Energy call of 3/8/15, clockwise from upper left: Diane Musho Hamilton, Jeff Salzman, Ken Wilber, Terry Patten. Background image is Emanations, a collaboration by Victor Raphael and Clayton Spada. Some of my friends in New Thought were befuddled by the heavy Buddhist terminology in the first part of a recent Integral Living Room call on Subtle Energy. So I want to share some of the highlights for me, as someone interested in what's next for New Thought. SUBTLE: Images, dreams, visions, the "feeling" of a room, etc. 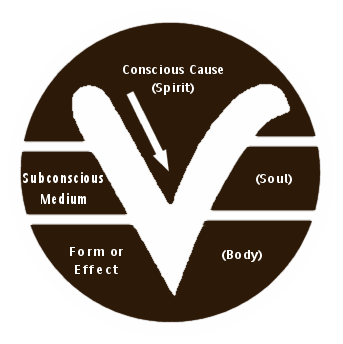 CAUSAL: "The subtlest possible patterns of consciousness and energy, a fractal pattern of causation that ripples all the way down though subtle and gross realities," as per Corey deVos in his excellent article "What is Subtle Energy." From a New Thought perspective, it might be said that affirmative prayer (aka treatment) "works" when it shifts us into the realm of Causal energy. But Ken Wilber started out the call by claiming that Subtle states are the gateway to Causal states. All states are available all the time. But you can't skip the gateway. This might explain why treatment starts with an acknowledgment of union with the divine--that opens our awareness to subtle states. The need for Subtle energy as a mediator, Ken said, is indicated in Christianity in that nothing transcendent happens between the Father and the Son without the presence of the Holy Spirit -- visualized as a Dove descending at the baptism of Jesus or tongues of fire at his ascent from form. This echoes the New Thought trinity, depicted in the symbol below. Science of Mind symbol based on charts by Ernest Holmes. Because a subtle experience is inherently subjective, each person's experiences will be different, Ken said. And this leads many moderns to be "allergic" to subtle experiences as non-scientific fantasy. The opposite danger, he said, is becoming too fascinated by subtle experiences, becoming "addicted" to them. The solution, he said, is Transcend and Include. Transcend the fascination with subtle experiences, but include their useful manifestations. But how do we develop awareness of subtle energy? The most useful comment for me was Terry Patten saying that the way to go to a place in the subtle realm is to think about it. Wow, I thought, That simplifies a massive field. Diane Hamilton told of a meditation student who wanted to leave her classes after six years because nothing was happening. She gave him instructions to point out subtle energy experiences he was having but not noticing. It revolutionized his experience and changed his mind to continue. Terry said that the work of Integral should not primarily be teaching people to achieve samadhis (states of bliss in meditation), but about developing a live engagement with each other in relationships. He called for an "indigenous" Integral approach, not based in Tibetan or other cultures. And for this approach he may have been "off the reservation" of previous Integral discussions. But now he is squarely in the center of them. Terry said we can think of two kinds of spiritual practice. Time-based: in which we discover the unique blueprint for our soul's journey using the animating energetics of this world. Jeff Salzman told how his primary focus these days is reclaiming the sense of enchantment he had in his traditional religious youth. As he nurtures a Second Person (I-You) communion with the Divine, he likewise communes with all of nature. 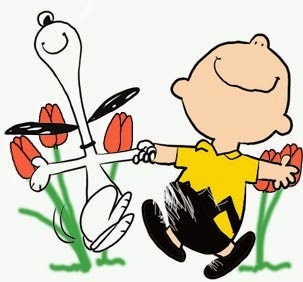 For example, he said he loves tulips in the springtime. He grows masses of them and surrounds himself with them. He speaks to them, telling them he loves them. And he likes to imagine they love him back. The trouble is, he says, enchantment can go too far. He begins to realize they may not love him because he chops their little heads off. And when he chooses one, is the one next to it lonely or jealous? I love the joyful way Jeff always brings things down to earth. The Course in Miracles tells us that the Holy Spirit resides in relationships. Second person is about relationships. And relationships, Jeff said, are messy. This call was offered in advance of an October Integral Living Room workshop in Boulder on Subtle Energy and Soul Work. I may consider going.